It seems like the anime world loves to capitalize on the, "trapped in a game" or game themed setting since most of them never fail to rate terribly in terms of viewership. Accel World is no different from Log Horizon, DanMachi, Sword Art Online and other video game based anime in terms of this; however I think Accel World is probably my favourite video game-based anime I've seen so far. Why is it my favourite video game anime? Well for several reasons, which I'm going to mention throughout this review! Reason number one on why this is my favourite video game-based anime is because of it's story. Compared to other video game anime, Accel World had a better game concept than your typical RPG adventurer setting. Accel world, short for the Accelerated World, is a game where users enter an out-of-body experience in the exact location they entered the Accelerated World at, only time has frozen (sort of). Not exactly sure what the time conversion of the Accelerated World to the real world was but on average one session in the Accelerated World was like 1.6 seconds in the real world. Basically players want to max to level 10, which no one has done yet, and only level 9 characters can achieve this through killing a certain amount of level 9 players. The premises of the game itself was enough to draw me in since it was not a RPG like Sword Art Online/ Log Horizon where you login and logoff, it was more like a PVP game that you can login and out with advantages that could be used in the real world. Although the story was nice, it was something that had me in fumes at times as well. Accel World started pretty strong with the first arc, but the second arc...oh lord. That plot for the second arc literally had my blood boiling with two of the characters. It was basically one of the worst cases of blackmail and betrayal I have ever watched, I literally cursed in real life at some portions during the the second arc. It got to the point during the first 10 minutes of the last episode that made me go, "how on Earth are they going to end this anime on a good note in the last 10 minutes?" Somehow they managed to do it and my sanity from watching this anime was restored. Yes there are a few plot holes, and things that are sprung out of no where for the sake of the plot, but Accel World miraculously makes it all work. Another thing I enjoyed about Accel World is it's cast. Probably the most diverse set of characters I've seen so far, not only mentally but physically as well. There are a few only worth mentioning. Haruyuki Arita: One worth mentioning is this guy. Haru peaked my interests in watching the anime based on character design alone. Never have I seen an anime where the main character was an overweight, somewhat appealing person. He's characterized as having low self esteem in the anime, so the overweight body image suited perfectly for that. Although he has low self esteem, it was nice to see that Haru was illustrated as a kind and compassionate person to his group of friends. Kuroyukihime: She's one of the very few level 9s in the Accelerated World, known as the Black Lotus, and plans to get to level 10. She also happens to be one of my favourite anime characters, not only for her amazing character design but for her ability to go against the grain and protect Haru against others at school who go after him for whatever reason. Seiji Noumi: One of the sources for my hatred towards the second arc. Every time I saw this guy I couldn't stomach him since he's just one of the worst antagonists I've ever seen. His antics are below the belt, you just want to strangle him at times and hope he goes away as soon as possible. Disliked his negative use of the Accel World to advance himself in the real world. Animation and music was not too bad. Nice fluidity in PVP battles, group battles and fluidity overall. I like the really liked character designs of everyone when they were in the real world, but when they jumped into the Accelerated World I had a bit of a problem with some of their character designs. Half of them would look nice but the other half looked sub-par. Black Lotus, Haru and Taku looked amazing in the Accelerated World but everyone else kind of reminded me of the Metabots... which is not bad, just saying they could have done a bit more to make the designs look better. Music was not the greatest, and I'll just leave it at that. All in all, I'll say that this anime is one of those anime that puts you on a rollercoaster like AnoHana and Clannad AS. Only instead of crying for feeling sad at certain moments, in Accel World you're put on a rollercoaster where you might, as I have, say things like, "what the bleeeeeeeeep," at times in the anime. I also liked how this wasn't a game-based anime where it wasn't about fighting monsters to level up (not to mention the interesting cast of characters). So for those reasons that's why I prefer Accel World over game anime like SAO, Log Horizon and DanMachi - weird, I know. Anyways thanks for reading if you made it this far. 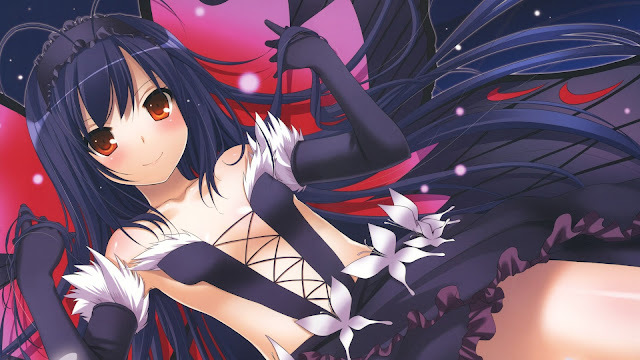 Please leave a comment if you have any thoughts on my review or Accel World you would like to share! Thanks again.